A full service payment account with a Prepaid Mastercard® for less than £5 a month. Comes with your own sort-code and account number. Use it to receive wages, and for day-to-day spend. Ideal if you need a primary or secondary payment account and don’t want or can’t get a traditional bank account. 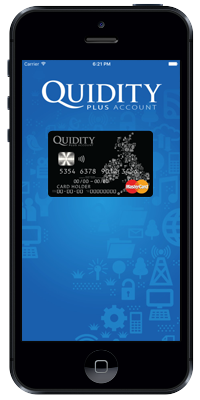 Applying for a Quidity Plus Account is quick and easy. Just fill out the online application. Pay the £4.95 using one of the options available. The card will be sent straight to your door within 10 working days. The Quidity Plus Account comes with a handy mobile app, which allows you to manage your money on the go, in real time. Simply go to your app store and download the latest version. *We’re legally required to confirm your identity when we receive your application. As long as we can do this, you’ll receive a card that allows you use all the great stuff a Quidity Plus Account has to offer. If we’re not able to fully confirm your identity, you may receive a card that still lets you shop everywhere in the UK, but which has limited functionality.